Radiate Love, to find it back. Yes and No. Yes, because that's the rule of nature and No, because when you do such a thing solely for the purpose of getting love back in return, then it is more like a business transaction. The moment there is want or greed in your mind, what returns to you, is usually "nothing". Why I mention this, is a) it took me some time to get this thing in my head, right. Now, that I know about it, I am happy to share this with you all. And b) A lot of people today say, that the world is bad and abundant with selfish people. Well, there is a reason for that. Most people want to do a transaction, rather than loving others purely. And because in return they usually get "nothing" they, themselves have become selfish, and have labelled others as unloving and mean. What I want to say is, that love purely, love completely, look for nothing in return. People say, I love her, she is mine or I love him, he is mine. Well, nothing is yours. Nothing was yours to begin with too, and nor shall anything be ever yours. You are living in an illusion, if you believe so. Tell me, what is it that you can actually call your own? Tell me, give me one example. I bet you can't, as there is nothing. So, let's decide, that for whatever little time, we are in this world, lets love each other, without conditions, without expectations. Love heals. Let us heal the world together and for good. Note: I actually related this picture to love as "white as a color represents purity, and purity is something usually related to love." Also Note: Radiate pure love, make it your default setting. 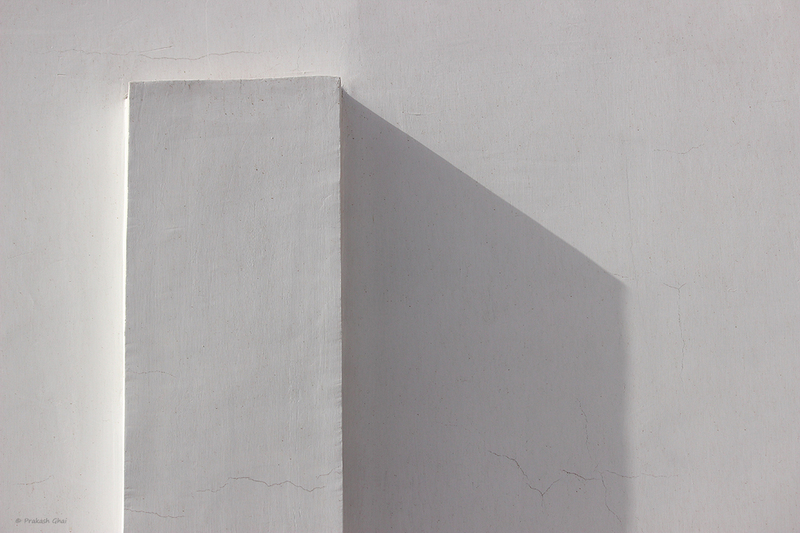 Back to the composition, this is Minimalism as Simple Geometry. What we have here is, one vertical rectangle on the left and its shadow casted on the right. The composition is fairly simple as it should be. White Minimalism, is always more appealing as well as pleasing to look at. The tough part here is not the composition, rather, the challenge in such photos is to be able to find these kind of white walls. They have become so uncommon these days. I remember when I was a kid, usually on the Diwali Festival, my parents used to get my entire house white-washed or painted in white. But, later even that changed to "just any new paint" not necessarily white, it usually off-white now. At least, in the city where I live in i.e Jaipur, it is extremely difficult to spot such walls. The most usual wall color is, either yellow or orange(pink-ish orange).